The main aim of an irrigation system is to provide conditions to produce economically what is achieved through production increase and cost reduction by unit produced. In this aspect, the parameters which express irrigation quality must be understood as decisive components of the planning process and irrigation system operations. It is indispensable to know the equipment performance, mainly with regard to distribution uniformity of water and applied water depth, in order to find ways of saving water and energy. When only enough irrigation depth is applied to an area (when this depth corresponds to the average depth), because of the lack of uniformity, a fraction of this area is over irrigated, whereas in another fraction there is water deficit. In the over irrigated fraction, one part is stored in the root zone for the use of plants and the other part is lost by deep percolation, transporting part of the nutrients from that layer as well. In the deficit fraction, the infiltrated water is stored in the root zone, however, in a lower amount to the hydrical needs of the plants. On the other hand, if the average depth of applied irrigation is higher than necessary, the fraction with irrigation deficit can be even eliminated, however the irrigation cost rises to the point of being economically achievable, besides aggravating nutrient leaching. Therefore, the distribution uniformity of water irrigation must be analyzed not only as simple dispersion data, but also as an important parameter in the economic irrigation assessment. In order to increase productivity, it is necessary that the entrepreneur apply all the technology available and, in agriculture, it is essential to apply water correctly to the cultures, since its development is under this condition. Irrigation stands out as one of the main techniques to be implemented, however a great deal of the irrigated areas of the country works with electric energy from the interconnected system of generation and transmission, or with small local hydraulic generations. With the constant raises of energy bills, water pumping has become an important portion of production cost, forcing the irrigator to seek alternatives that may reduce costs. Electric engines consume most of the electric energy used in irrigation systems, and the incorrect measuring of this equipment may cause higher electric energy consumption. The use of variable speed drives, which enable the variation of irrigation pump set rotation, allows adjusting electric energy consumption to charge needs. 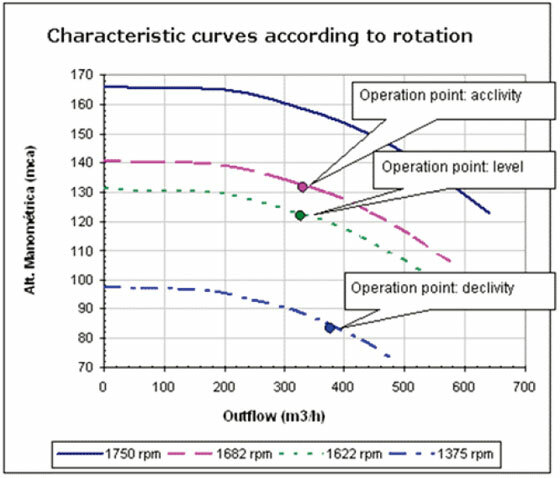 Conzett and Robechek claim that one of the ways to operate a pumping system properly in order to reduce outflow, is to change pump rotation until the necessary outflow is obtained, according to Rateaux relationships; that does not imply that introducing charge loss and operation timing is not changed. Tiago Filho claims that the variable speed drive is a piece of equipment capable to produce this effect fast and efficiently, and it works changing the frequency of tension applied to the engine, enabling it to control its rotation; still, according to this author, the use of the variable speed drive in pumping system industry is a very common experiment, because its economic applicability is justifiable by the reduction of energy consumption, compared to other procedures, specially valve closure. In irrigation systems, the electric engines used to activate the pumps are usually dimensioned to supply the greatest outflow demand associated with maximum manometric height. The use of variable speed drives in these systems may result in substantial reduction of electric energy consumption. Henson et al. quoted by Carvalho et al. have applied the variable speed drive in some irrigation systems with these aims, in the U.S, obtaining satisfying results, once the reduction of the consumed power, caused by equipment use, had generated substantial energy saving. In this context, this article aimed to evaluate the distribution uniformity and water depth applied in center pivot irrigation equipment according to rotation speed variation of the irrigation pump set with the use of a variable speed drive and the effect of the side line position in these parameters. The experiments were carried out in the second term of 2008 on Nossa Senhora Aparecida farm in the municipality of Coronel Macedo, in São Paulo, whose coordinates are: latitude 23º41' south, longitude 49º11' West and 630 m elevation. There are three pieces of Valley Center pivot irrigation system installed on the farm called PC-07, PC-08 and PC-09. This equipment is interconnected by a single adductor and works with the same pumping set interspersedly, where this set is controlled by a variable speed drive start key. The experiments were carried out in the PC-09 pivot, which is the closest equipment to rainwater catchment. The main characteristics of the irrigation equipment evaluated are: circular irrigated area: 43.94 ha; time (100% relay): 6,87 h; total outflow: 338.59 m³ h-¹; side line length: 347.55 m; total irrigated range: 374.0 m; unevenness between the pump and the pivot Center: 51.0 m. Three positions have been tested for the experiment: 3.45% acclivity, level and 11,78% declivity. The experiments have been performed according to rule Project nº 04:015.08- 008 of Brazilian Association of Technical rules (ABNT), installing two radial lines of water traps, with a regular and constant 3 meter-space among traps, from the pivot center to the irrigated area extreme, perpendicular to the equipment side line topographic pro+ling with a crack angle of 3º between the lines. The percentage of the equipment relay was adjusted to 100% in order to perform the tests. The climate data collected during the experiment were wind speed and evaporation. To check wind speed and evaporation during the experiment, an Instrutherm portable digital thermal anemometer, model TAD-500, 0.3 to 45.0 m s-1 speed reading and ± 3 % precision was used. Evaporation during each experiment was measured using control collectors installed in the surroundings of the pivot base, where the values obtained were added to the collected water depths, as ABNT determines for this kind of experiment, averaging out the total liquid depth applied by the equipment. Pressures in the pumping set have been checked using a Bourdon manometer with 21.00 kgf cm-2 reading and ± 1 % precision. At the pivot point (in the ascent pipe) and in the equipment end (before the pressure regulator) the pressures have also been measured with a Bourdon manometer according to ABNT rules to check out deviations with regard to the technical project. To work out the recovery time of capital invested in the acquisition of the variable speed drive in order to reduce electric energy consumption, value of saved electric energy consumption (Vc) was simulated during the equipment use period. To do so, the energy saved was examined by the use of a single nº 9 pivot working 20 hours a day only during 1/3 of the dry period of the year (from May to November), once during the other 2/3 of this period the variable frequency drive key would be connected to two other pivots (PC-07 and PC-09), which are positioned in more elevated areas. The experimental design was a completely randomized with three replications (times in each tested position). Analysis of variance was applied followed by Tukey test. The climate data record in the Field, wind speed and evaporation of the collectors (rain gages), are shown in Table 1. In respect to wind speed during experiments, the values measured did not exceed the limit in the rule project, in which wind speeds above 3,0 m s-1 invalidate the tests. e values observed during experiments did not exceed 2,6 m s-1. Table 1. Wind speed and evaporation values during experiments. In table 2, the values of rotation were statically significant among the three positions. In these experiments, the variable frequency drive programming established variable pressure in the pumping exit according to the side line position in the area, that is, 132,5, 122,5 and 82,5 mca for the positions of acclivity, level and declivity, respectively. Therefore, in order to cause such pressures, the rotation would have to be reduced when the side line moved from acclivity to declivity, according to Rateaux relationships. This programming is correct for this starter and operation device, because as the line goes from acclivity to declivity, the manometric height falls, however the part concerning the level variation is transformed into pressure that operates, above all, in the sprinklers subdued to this level variation and, on account of that, the pump rotation can be reduced by variable speed drive without reducing sprinkler operation pressure, therefore causing a consumption reduction and energy demand in the system. Table 2. Side line relative position effect in the irrigation pump set rotation. Alves et al. tried to check the veracity between Rateaux relationships and the reduction of power consumption in the pumping, when the variable speed drive is used, which allows rotational variation in the irrigation pump set. Through the use of the variable speed drive, the average reduction of power consumed was 40.7 and 75.0% by reducing the rotation from 1800 to 1500 rotations min-1 and from 1800 to 1100 rotations min-1, respectively. Table 3 shows the results of the uniformity distribution, where the irrigation pump set rotation varied in the attempt to meet the manometric height demand according to the side line position in the area (acclivity, level or declivity). Though there was significant difference in rotation among the experiment positions (Table 2), there was not significance between uniformity and distribution values, proving that the pressure regulators set performed satisfyingly, irrespective of the position of operation, whether in acclivity or declivity, resulting in a good uniformity in three experiment positions, according to ABNT. Table 3. Distribution uniformity coefficient. * Analysis of variance not significant (5% probability). Zocoler, Cesar and Vanzela verified that, after evaluating central pivot irrigation equipment in three positions of operation (acclivity, level and declivity), the side line position did not influence water distribution uniformity of this very equipment. Table 4 shows catchment results of water depth. Unlike rotation, there was significant difference in the three positions (Table 2), there was difference of depth catchment only between declivity versus level position and declivity versus acclivity position. Considering that the variable frequency drive had been programmed to fulfill pressure needs adequate for each position, the depths were not supposed to differ statistically. However, even with the exit pressure adjusted to 82.5 mca in declivity, this value happened to be enough for the outflow to be greater than previous positions and, in this manner, it promoted elevation of the applied depth. Table 4. Rotation and irrigation depth values. Analysis of variance not significant (5% probability). Zocoler et al. upon evaluating the effect of the side line position of center pivot irrigation equipment in the applied irrigation depth, concluded that although the center pivot end ranged 24.37 m, vertically, between acclivity and declivity, there was no significant effect of positions in this variable. In Figure 1 the pressure-based operation points can be observed in the exit of the irrigation pump set, outflow estimated through weighed average depth and motion of this position points in acclivity and from level to declivity. Figure 1. Operation points Hman (mca) x Outflow (m3 h-1), according to pressures measured in the irrigation pump set and outflows estimated from a weighed average depth. As the operation condition determined rotation variation on account of manometric height demand, this is one of the main factors responsible for variable frequency drive implantation in irrigation pump systems. Table 5 shows energy consumption-related parameters of the irrigation pump set. There was significant difference of consumption in the three experiment conditions (acclivity, level and declivity), as well as in rotation and booster pressure results. The results showed that average energy consumption between the ground ends had 40.13% reduction. Analysis of variance not significant (1% probability). Mello et al. had an array power reduction of 35.87% and 28.02% by comparing the difference of power consumed by a variable speed drive in pumping setting aimed to control pressure in irrigation lines, through the reduction of irrigation pump rotation, concerning usual handling procedures: charge loss insertion and irrigation time reduction of the line, respectively. Due to local conditions, in which a single pumping system supplied three Center pivot irrigation systems, it would not be possible to use a starter command other than the variable frequency drive key, since the irrigation pump rotation must vary according to center pivot in operation and its side line position. Therefore, the reduction of average electric energy consumption was estimated to PC-09 according to rotation reduction. Federal taxes: (PIS/PASEP and COFINS), that generally add up to 4%, were not included in the bills. Knowing that the variable frequency drive key acquisition price is R$ 65,200.00 and that two soft starter keys should have been purchased instead (even with limitation of the case), whose acquisition price is R$ 10,850.00 each, recovery time of invested capital between these two options, due to energy saving only, would be of 6.74 years, what seems a very interesting investment, as well as the fact that the variable frequency drive key dispenses with the use of capacitor bank for system power factor correction. Applied water depth values for the experiments were above the specified values in the technical form provided by the equipment manufacturer, showing the necessity of evaluating irrigation equipment after installation. In that way, it is possible to improve their performance not only in water application but energy consumption as well.